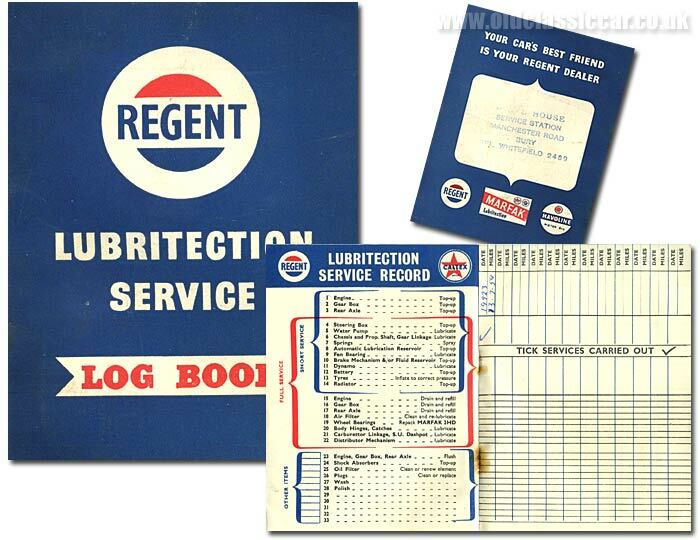 Regent car lubrication booklet from the 1950s. Homepage. This page: A free Regent Lubritection service log book, originally used with a 1950's Austin Cambridge. 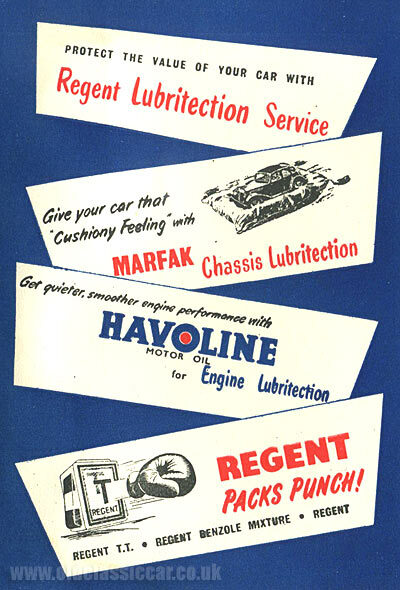 In the 1950s, Regent was just one of many companies offering motor fuels and lubricants to passing motorists from garage forecourts. This small booklet, or "log book", was offered by Regent as a way of keeping track of one's use of their Lubritection service. This particular log book was used by the owner of a 1950's Austin A50 Cambridge, although despite him owning the car until the late 1990s, there is only one record of him using the Lubritection service, in 1959, by which time the Austin had covered 19,923 miles. A stamp on the rear cover advises that this service was offered at a Service Station on Manchester Road, in Bury, the area in which the Austin lived. The Short Service saw the engine, gearbox and rear axle topped up as necessary, along with attending to the usual grease and lubrication points dotted around the car. The Full Service saw the engine and transmission drained and re-filled with fresh oil, with additional items such as door hinges, distributor, air filter and carb linkages attended to as the mechanic saw fit. Inside the rear cover are advertisements for other Regent products and services. This included giving your car the "cushiony feeling" with a dose of Marfak Chassis Lubritection, and smoother engine performance thanks to Havoline Motor Oils. Regent motor fuel, whether straight Regent, Regent T.T. or Regent Benzole Mixture, would, we're told, "Pack Punch". More items relating to motoring, including oil- and fuel-related bits and bobs, can be found in the Motoring Collectables section of oldclassiccar. More information specifically on collecting items relating to Regent, Pratts, Shell Mex and the other petrol/oil companies, can be found on the Petroliana page.